Email Hyperlinks for a user to auto load the EDT task for data correction! 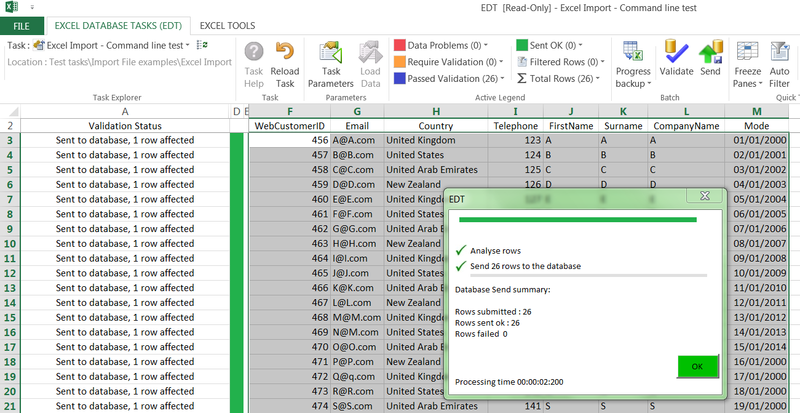 The EDT tool has many uses, including validating and processing data from many sources. Once you have designed a data processing task you may well wish to automate the running of the task by way of scheduling the operation, and only make use of the EDT interface when there are data validation errors that a user needs to correct before the task can be completed. data interface can be used to easily correct data problems. EDT tasks can be launched from a Hyperlink or a Batch command file. With these abilities we provide a sample script file here to show how this is achieved, making use of the launch from Hyperlink ability within the generated report emails. You can copy this batch file, making amendments to the Task ID and and Email parameters as highlighted. The above command script generates an Email report after Task execution. 05:39:50:Load task:Excel Import - Command line test. 05:39:51:Apply defaults, formula and hyperlinks. 05:39:52:Validate 24 rows with database. 05:39:52:This task is configured to prevent Send until all rows are valid. The user simply clicks the Hyperlink in the email, this automatically Loads the EDT application and loads teh specified task and task parameters. 04:42:14:Load task:Excel Import - Command line test. 04:42:16:Apply defaults, formula and hyperlinks. 04:42:16:Validate 26 rows with database.